What's it about? 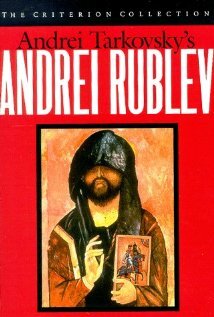 Set in 15th century Russia, it's a loose account of the life of the great icon painter Andrei Rublev. Prepare yourself for a meditation on art, faith, history and a lot of mud. Is it any good? I suspect there might be true greatness in Andrei Rublev. A little follow-up reading reveals themes, symbolism and historical significance that my tiny mind cannot possibly hope to grasp in full. And yet (whisper it), it feels like a bit of a chore to watch it. However, there's no denying it's ambitious, challenging film-making, judiciously dividing its long running time into different chapters, each presenting a stage in Rublev's life. With this framework set against the wider historical context of medieval Russia, it depicts the obstacles he faced and his subsequent growth as both an artist and a man. It features some stunning B&W photography and stirring set-pieces, all put together with an impressive sense of scope and scale. So that's good. For all that, though, it's pretty heavy going and certainly drags at time, making it seem even longer than it is. I'm glad I watched it, but I'd have no burning desire to watch it all in its entirety again. Recommended if you're tired of formulaic Hollywood fare and want to give the old grey matter a shake-up. Not recommended if you're on a first date and hoping to get lucky afterwards. I don't trust you. What do others think? Generally regarded as a masterpiece of World cinema and turns up regularly on Greatest Films lists such as this. It's a big hit with the arts and faith crowd too, who hold up the film as example of how great religious epiphany and artistic freedom can come in the face of adversity. On the other hand, the RSPCA must have a collective conniption fit every time they watch this - it doesn't end well for some horses and CGI-effects weren't around in those days, if you see what I mean. Anything else I should know? If you're wondering what all the fuss about Rublev is, the film finishes with a colour section showing his greatest paintings and icons. For your homework, you can read about the life of Rublev here and an essay about the film here. If you want to brush up on your 15th Century Russian history (and who doesn't? ), here's a little light reading. I expect a summary in your own words on my desk by next Friday please.